For the most part, aquatic creatures spend their entire lives submerged. However, a few aquatic animals—those that are descended from land animals—come all or part of the way out of the water for one reason or another: sea turtles, pinnipeds, and penguins come ashore to breed, for example. 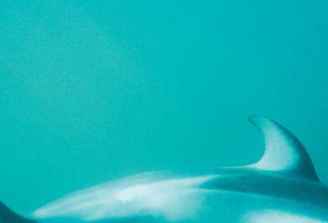 Mammals, such as whales and dolphins, have also acquired some handy adaptive techniques for life in the water, coming to the surface only to breathe. The smallest of the marine mammals is the sea otter (En-hydra lutris), at 5 ft (1.5 m) long, including the tail, and up to 70 lb (32 kg). The largest is the blue whale (Balaenoptera mus-culus)—the largest animal alive—which can be 110 ft (33.5 m) long and weigh 300,000 lb (136,000 kg). To varying degrees, these mammals that have returned to the water have retained vestiges of their terrestrial forms, including hair, which only mammals have. Sea otters, seals, and sea lions are thickly furred; manatees and dugongs have a sparse pelage, but they have many whiskers around their mouths. Dolphins and whales are hairless, but in some species hairs are present at birth (they are soon lost). Sea otters have hand-like paws on their front legs, but their hind feet have become webbed, so that they're almost flippers. 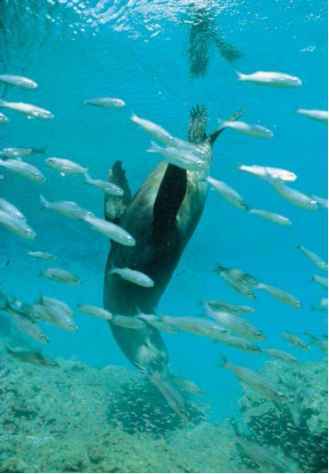 The four legs of pinnipeds have become flippers, and the sirenians have front flippers (some of them have fingernails), but no hind legs, and a flattened tail for propul sion. Whales and dolphins have no hind legs, flippers instead of forelegs, and a horizontal tail (fluke) for propulsion.